Sir Buttercup has been playing in the mud. We are going to hold our first annual Spring Fest on Saturday, April 28, 2012. This will be our first farm “open house” and it will be free and open to the public. Come see the animals, young and older. We already have eight lambs. 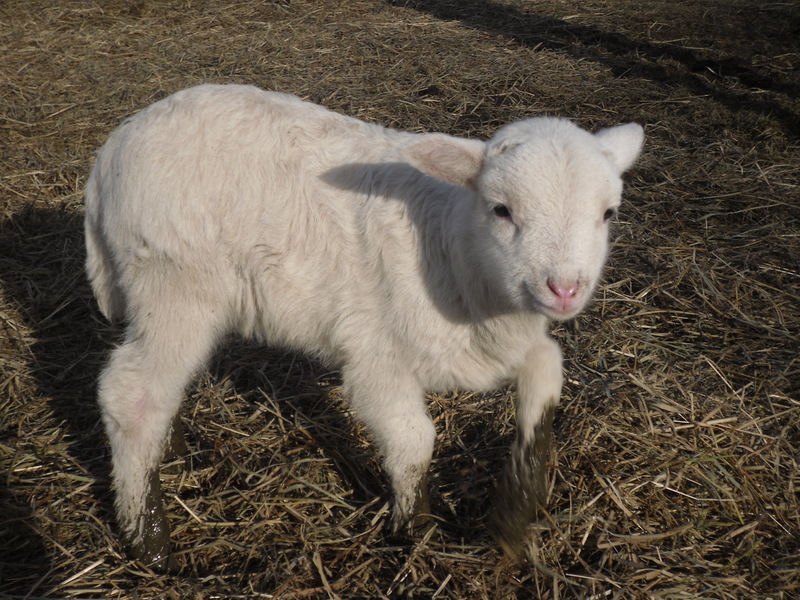 By Spring Fest we will have more lambs, a calf, chicks, and maybe some goat kids. We will have sampling of our pasture raised chicken and will be taking orders for chicken and lamb. EGGS. Now that the days are getting longer, the chickens are back in business. We are getting more eggs every week and are now beginning to average one dozen per day. We have also ordered 50 more layers to help us keep up with demand. Effective March 1, 2012, we will be raising our egg price to $3.50 per dozen. We crunched all the numbers and our 2011 supplemental organic feed costs alone were $2.28 per dozen. If you include miscellaneous supplies, the new price leaves our labor rate at less than $5.00 per hour and, folks, we want to make our sole job bringing you healthy food. We will continue to work to bring chemical-free, sustainable food to your table at a reasonable cost for you while earning a reasonable wage for us. LAMB. We still have lamb for sale from our 2011 animals. All of our lambs have been processed at an inspected facility. Please contact us or stop by the farm for the cuts still available. For 2012, we would like to sell the lambs by the half or whole. This will give you more meat for your dollar and will allow us to not have to stock freezers full of lamb. We will have lamb available in August 2012 and will work out the pricing soon. GOAT. We still have goat meat for sale. The goat meat was also processed at an inspected facility. The goat meat is all in seasoned sausage and tastes like pepperoni. We are selling the goat meat for $5.50 per pound. PORK. We will have pork available in the near future. This will be limited as we are officially out of the pig business. Stay tuned to the website for pricing and availability. CHICKEN. We are planning to butcher our own pasture raised chickens this year. In order to do this, you will need to pre-order your chickens. Our first batch will be available around July 4th. We will be selling the chickens for $3.00 per pound and expect them to weigh 4 to 5 pounds. Please continue to follow our website. You can also find us on Facebook as Full Circle Farm and you can follow us on Twitter @farmerpaulfcf.